The students in grade 9 have been exploring the adventurous epic of Gilgamesh, the first story ever written down. 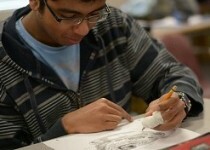 In this, students are to read, analyze, and decipher the text and answer questions accordingly. Students are truly excited to read this tantalizing tale. The Grade 11’s were lucky enough to have Professors Krieger, Kushner, and Morris from the University of Toronto physics department come in and talk about their research and projects. 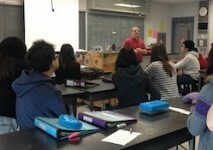 Students listened eagerly as topics from particle physics to patterns in nature were discussed and demonstrated. 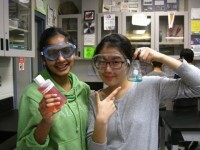 This week, the Grade 12 Biology classes started the first of their “Hot Topics” projects. Students are working together in groups to analyse scientific articles related to topics studied in the curriculum. 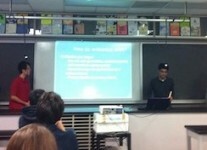 Presentations this week included an in-depth analysis of the use of antibiotics and a study on stem cell research. This week in the Grade 10 science class, students performed a lab in which they learned about the Law of Conservation of Mass. The budding chemists experimented with different chemicals to create brightly coloured liquids and precipitates, and dropped alka seltzer in water to inflate balloons.